If you have been playing golf for quite some time especially at Thousand Hills Golf Resort in Branson, you might have wondered why the golf balls have dimples? Dimples on a golf ball have some purpose that only a few know. Golf balls were built originally to have a smooth surface. But golfers soon noticed that older balls that were beat up with bumps and slices on the cover seemed to fly farther. With this idea, beat-balls soon became standard issue. When many golfers realized that a scuffed-up ball travels faster than a shiny one, balls gained dimples. Today, many golf ball makers invest millions of dollars each year to design better performing golf balls. Experts in aerodynamics must have realized that the nicks and cuts in old golf balls were acting as “tribulators” that can induce turbulence in the layer of air next to the ball. At some point, dimples in golf balls create turbulence or mixed airflow which when done right can reduce drag. Despite the drag, the ball can go farther in air than it would in vacuum with the same initial velocity. Dimples on the golf balls significantly decrease the drag on the ball as it flies through the air, as compared to a smooth ball. Not only that, golf balls with dimples also increase the lift. These two things can make the golf ball go as much as three times farther than the same ball without dimples. Dimples also increase “Magnus lift”, a peculiar lifting force experienced by rotating objects that travel through a medium. The effect of Magnus lift can cause the golf ball to hook or slice if it has sideways spin. A golf ball normally leaves the tee with a speed of 70 m/s and a minimum backspin of at least 50 rev/s. The Magnus force can be effective due to the drag on the air on the top and bottom portions of the golf ball. 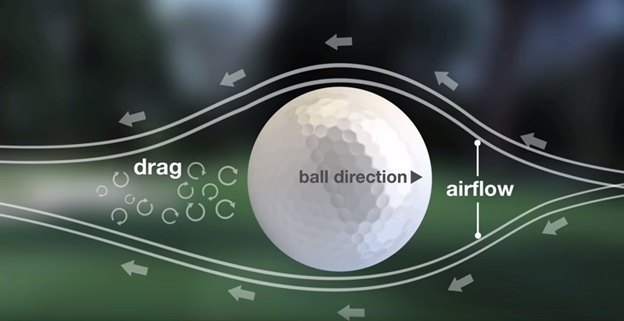 The top portion moves slower to the air, so there is less drag on the air that goes over the ball. The bottom portion moves fast to the air around it, so there is more drag on the air that passes by the bottom. The boundary layer is relatively thick and the air in the not-too-near region moves slowly to the ball. Golf balls today come in two different varieties, recreational and advanced. The advanced golf balls are designed to create greater spin and take a lot more swing power to compress. With powerful swings that are mostly done by professional golfers, will result in the ball traveling much further than the same swing on a recreational ball. A weak swing with the advanced golf balls travels about 80 miles per hour or lower. The ball won’t travel as far as that same weak swing on a recreational ball. So, if you want to see the difference in travel speed between golf balls with dimples and smooth golf balls, try to play golf at Thousand Hills Golf Resort in Branson.